In the final stages of mesothelioma, patients may experience more frequent episodes of chest pain, coughing and dizziness as treatment begins to lose its effect against tumors. Although patients hope to spend as much time as possible with their loved ones, worsening symptoms may make them worry about a potentially shorter scenario. At that point, making end-of-life decisions can help patients and their loved ones feel more prepared for whatever the future holds. As you learn more about your prognosis and how you can improve your quality of life, discussing these with your family presents an opportunity to explain your end-of-life choices and why those decisions are important to you. Communicating these choices can relieve anxiety and help your family understand your wishes. Discussing options with people whose opinions you trust can also help you make some of the tougher decisions you may face. 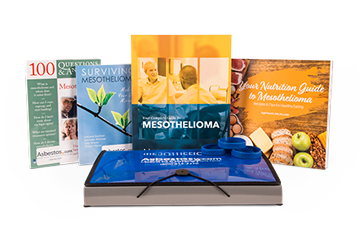 At the end of mesothelioma’s progression, some patients choose symptom management instead of curative ones. That tells a medical team to focus on discomfort and not on trying to kill tumors. Doctors may present you with this option or they may not. But it is an option you always have. Ask your doctor if palliative care would effectively improve your quality of life. Patients should tell their doctors and nurses where they want to receive care. Some prefer to remain in a hospital or inpatient hospice program with 24-hour professional attention. Others are more comfortable at home, surrounded by family, friends and pets. If you choose home care, you will need to designate a caregiver, someone who can ensure your home can accommodate your medical needs and any particular new medical supplies (oxygen tanks, a hospital bed, etc.). A terminal prognosis often makes patients worry how their dependents will be cared for, how funeral and burial services will be arranged and how possessions will be distributed. Although this is an emotional time for patients and family members, planning ahead for these practical matters and reaching out to a mesothelioma support group helps make the end-of-life process much easier for survivors. Patients should name beneficiaries for any insurance policies they hold; designate survivor’s benefits recipients from unions, employers or lawsuits; decide who will receive their final tax return; and decide what should happen to any investments such as an IRA or 401k. All of these financial decisions should be written into a will, which should be signed and placed in an easy-to-find location. Personal information – a patient’s social security number, vital records, account passwords and important contacts – should be stored in the same place. A trusted family member should be told where these documents are kept. Creating a will is the easiest way to ensure that your finances will be handled the way you prefer. End-of-life decisions can also dictate what a patient would like to happen after they pass away. Who will care for my minor children and/or pets? Do I want to donate any healthy organs to an organ bank? Where do I want to be buried or cremated? What sort of funeral do I want, and how will it be paid for? Mesothelioma patients often have the option of filing an asbestos lawsuit to help cover their medical bills and provide for their families after they have passed. These lawsuits are handled almost entirely by lawyers, allowing you to spend your time interacting with your family instead of worrying about a court case. In some late-stage cases, life-sustaining equipment such as a ventilator, respirator and feeding or hydration tube may be needed to keep a mesothelioma patient alive. Determine in advance which forms of life support you are comfortable receiving and how long those can be used. These choices should be clearly explained to your medical team and included among any advance directives in your medical file. While planning is recommended to make any future decisions easier, late-stage mesothelioma can interfere with a patient’s ability to make those choices. To plan for this, a patient can give someone power of attorney – usually a trusted family member or friend – to make decisions for them. A “durable power of attorney for health care” is designated to make treatment decisions on a patient’s behalf. Patients should choose someone that they trust to make medical decisions in accordance with their own values and ethics. In addition to designating someone to make choices concerning your healthcare, you will want to specify who can make decisions about your estate. This person, a “durable power of attorney for financial affairs,” will not need to handle many – if any – decisions if you have a valid and signed will in place. However, in the event that your will is incomplete, challenged or invalid, this individual will be responsible for making financial decisions on your behalf.